Sorry for the absence in December and this month. Russell, Jake, and I drove down to Alabama in early December to enjoy the holidays with our families. I planned several things to share with you while we were on vacation, but once we got there I decided to take a short break and enjoy the time with our families instead. I hope everyone had a great Christmas and New Years. We certainly did! I know that I have posted several recipes in the last couple of months using cranberries but they are so wonderful I just can’t help it. I have been using them in everything. They are technically out of season, although you might be able to find them at a few places. If you are like me you probably have a few bags hanging out in the freezer to hold you over until you can find them again. I have followed Bridget’s blog, The Way the Cookie Crumbles, for as long as I can remember. 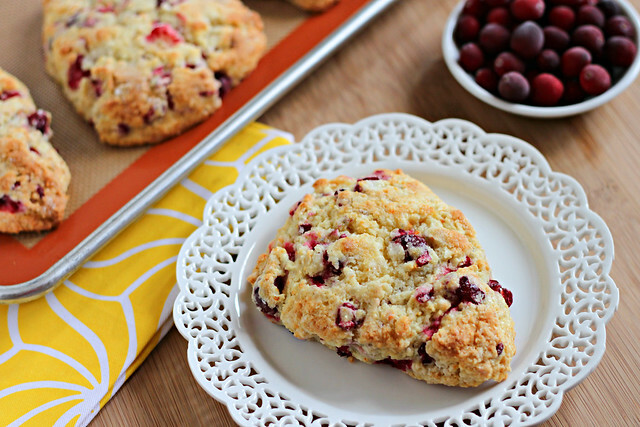 I bookmark just about everything she posts, but the scone recipes that she shares are always a favorite of mine. Scones are pretty simple to make and can be made ahead of time and frozen for later. That way when I want something for breakfast, but don’t feel like cooking, I can just bake a few! 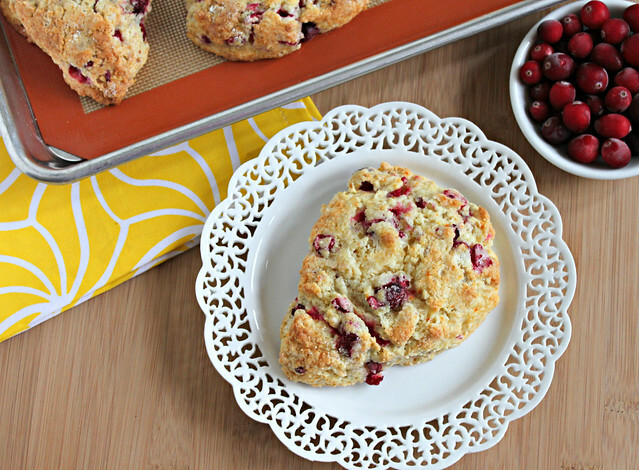 The combination of cranberries with orange or lemon is one of my favorite. I used tangerines in this recipe because that is what I had on hand. While the orange flavor was there, I think it would be more apparent had I used oranges instead of tangerines. Either way, these were wonderful. This recipe makes 8 fairly large scones. If you are baking these straight from the freezer, just be sure to add a few minutes to the baking time. I hope you enjoy these as much as we did! 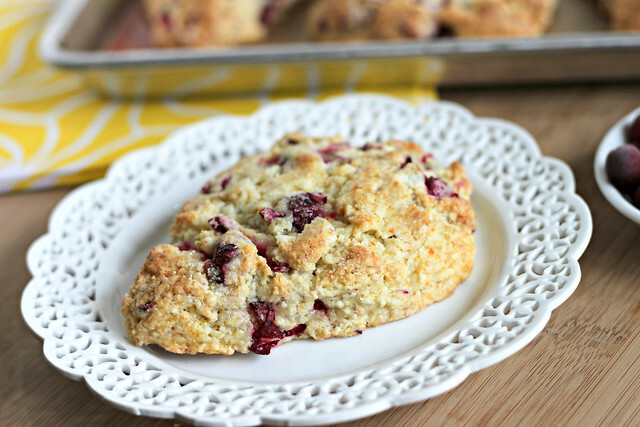 Also, if you are looking for other scone recipes, these grapefruit honey yogurt scones are also a crowd pleaser! Preheat oven to 400 degrees F. Line a baking pan or cookie sheet with parchment paper or a silpat. In a small bowl, toss cranberries with 3 tablespoons sugar, set aside. In a small bowl, beat together egg and egg yolk. Stir in cream. In the bowl of a food processor, add 1/2 sugar, flour, baking powder, salt, and orange zest. Pulse to combine. Add cold butter and pulse until mixture resembles coarse crumbs. Transfer flour mixture to a large bowl. Gently stir cranberries into the flour mixture. Using a spatula, fold the cream mixture into the flour until just combined. On a well-floured surface, shape the dough into an 8-inch circle, about 1-inch in thickness. Using a pastry cutter, cut the dough into 8 wedges. Place each wedge on the prepared baking sheet and bake for approximately 15-20 minutes. Remove from the oven and place on a wire rack to cool. Allow to cool for 10 minutes before serving.